Background: Drinking more than the recommended limits is a worldwide emerging problem, difficult to circumscribe, and alcohol-related brain damages are an under-recognized health problem. Alcohol-cognitive disruption can be considered as transient and recoverable if the alcohol consumption is limited and occasional; if not, it can progress to the so-called Alcohol-Related Dementia (ARD), or to the Wernicke encephalopathy, or it can even induce the Korsakoff syndrome, an irreversible and long-lasting medical condition. ARD still remains poorly diagnosed and addressed, despite having increased research interest being a frustrating condition, a relatively non-progressive, or even partially reversible condition in abstinent ex-drinkers. On the contrary, Wernicke encephalopathy, with its neurological symptoms (ocular coordination imbalance and gait ataxia), is a dramatic medical condition, potentially lethal which can lead towards Korsakoff dementia. 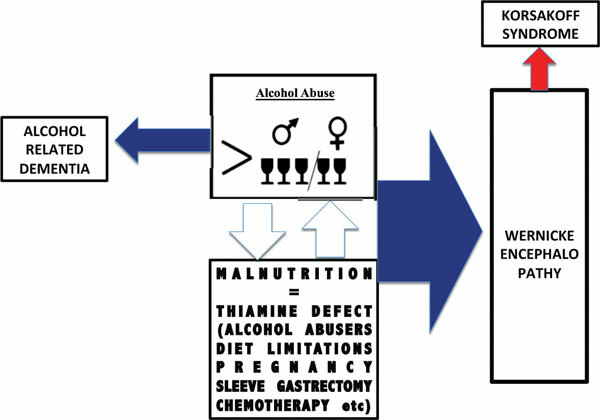 The alcohol consumption is a strong reinforcing condition of the thiamine deficit, the main biochemical determinant factor that starts the cascade of the brain irreversible damaging events. Conclusion: Our review focuses on the possible common neural pathways of this three condition, on the biochemical basis of the damages, and tries to underline the strong need of better understanding the pathogenesis of the brain lesions, including epigenetics and the nutritional aspects of the problem. Alcohol consumption, alcohol-related dementia, Wernicke encephalopathy, Korsakoff syndrome, thiamine, epigenetics.